Sweet Chestnut (Castanea sativa) is a beautiful, majestic tree, especially attractive in early summer when it bears long yellow catkins, tipped with flowers. When young, its bark is smooth, but as it matures it develops characteristic spiralling grooves. The most unique feature of this tree, however, is the edible nuts it bears. A traditional seasonal food, the delicious chestnuts can be roasted and eaten. Sweet chestnut requires at least two trees to be planted to stand any chance of a crop of chestnuts and we think that north of a line from Manchester across to Kings Lynn this may be difficult. 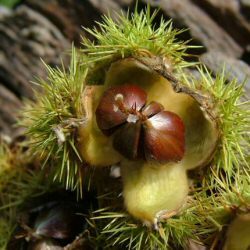 Sweet chestnut does well in most soils and is tolerant of pollution, and has been known to live for up to 435 years! . Expect a final height of at least 20m (65ft 7in). This tree is supplied at a height of 1.2 and 2.0 metres in a 7-12 litre container for year round planting and better results than from bare-root stock.